SAN FRANCISCO (AP) –Marissa Mayer’s nearly four-year attempt to turn around Yahoo needs a turnaround itself, repeating a pattern of futility that has hobbled one of the Internet’s best-known companies for the past decade. Like her predecessors as Yahoo CEO, Mayer has been unable to snap the company out of a financial funk despite spending billions on acquisitions and new projects. Yahoo’s stock has sunk by 35 percent so far this year as investors’ frustration with the follies have mounted, spurring calls for her replacement. Jackson, though perhaps Mayer’s most outspoken critic, isn’t alone. After conferring with investors, SunTrust analyst Robert Peck recently wrote a letter to Yahoo’s board recommending that the directors consider firing Mayer. Activist investor Jeffrey Smith of hedge fund Starboard Value is urging Mayer to abandon a spin-off of the Yahoo’s most valuable asset –a $30 billion stake in Chinese e-commerce giant Alibaba Group – and sell the company’s Internet business instead. 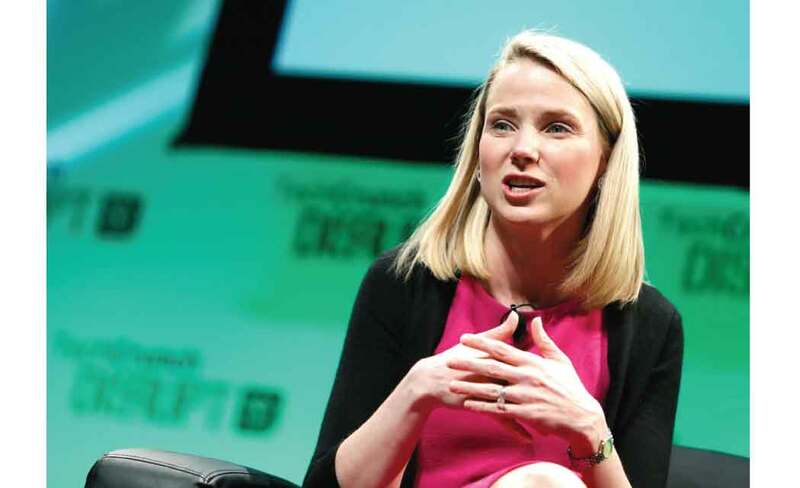 If Mayer continues down her current course, Smith is threatening to lead a shareholder mutiny aimed at overthrowing Yahoo’s board next year –a rebellion that, if successful, could lead to her ouster. Yahoo’s own employees seem dispirited as well. Mayer’s approval rating among those who posted on the employer-review website Glassdoor.com has fallen to 73 percent from 99 percent after her July 2012 hiring. At least a dozen members of Yahoo’s management team have left in the past year. The departures have included two of Mayer’s top lieutenants, former marketing and media chief Kathy Savitt and former development and acquisitions chief Jacqueline Reses. Yahoo’s revenue fell eight percent from the previous year after subtracting the company’s advertising commissions, its steepest decline since Mayer became CEO. It’s likely to fare even worse in the October-December quarter, given that that company expects net revenue to drop by about 20 percent. Now Mayer is drawing up plans for another major shake-up, one likely to eliminate hundreds of jobs as Yahoo sharpens its focus on “fewer products with higher quality,” as she said in October. Mayer promised more details in January. It wasn’t supposed to get this bleak with Mayer at the helm. She came to Yahoo as a widely respected technology executive who had helped build Google into the Internet’s most powerful company while repeatedly outmaneuvering Yahoo with products that attracted more traffic and advertising. Mayer’s arrival was supposed to herald a promising new era after the disheartening downfalls of the four CEOs that preceded her. Those executives –Terry Semel, Jerry Yang, Carol Bartz and Scott Thompson— either resigned or were dumped when it became apparent that they couldn’t revive the growth that made Yahoo one of the Internet’s biggest successes during the dot-com boom of the 1990s. Things started well. Mayer bought dozens of startups to bring in more engineering expertise in mobile devices and overhauled Yahoo’s apps for weather, sports, Flickr and email. She made big splashes by hiring former NBC News anchor Katie Couric to handle online video reports and acquired the trendy blogging service Tumblr for $1.1 billion. The moves haven’t really paid off, although Mayer continues to boast about Yahoo’s progress in the important mobile and video markets. None of Yahoo’s services rank among the top 50 free apps in Apple’s store.